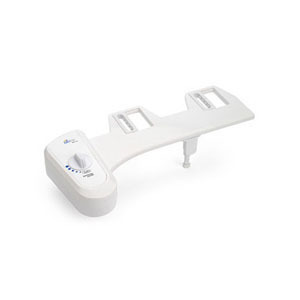 Simplet bidet attachment is a simple and easy bidet attachment system. With brass inlet, braided metal water supply and brass Universal 7/8" T valve. Fresh, clean, and simple! The Simplet BB-70 easily attaches to toilet to provide a feeling of refreshing clean after each use with no electricity or battery required. By connecting directly to your fresh water supply, the Simplet BB-70 provides a continuous water stream at varying pressures which can be adjusted by the P.S.P.C (Positive Stepping Pressure Control) selection dial. Simple and easy to install and use. No electricity or batteries required. Universal brass T valve as standard supply. Durable braided water hose supply.